Freddie got a buck last week. Before he even made it back to town to have it tagged, his son was as Bishops Store waiting for him:? And our friend, Bill, heard about it in the grocery store also…before Freddie had it tagged. So I guess the moral of this story is, watch what you do as the news travels fast around here. This shot was taken after they started cleaning them so what they are holding is not all of them. And sorry, the sun was bright at that time and I do not know how to fix that. My photographer friend undoubtedly will have something to say about this. The firearm deer season has ended. Two of our guests got a buck this year and the others, although a little discouraged, all seem to have a great time anyhow. Many hunters who come to the area love just being in the great north woods, being with friends or family (we had quite a few father and son combos this year which is so wonderful to see) and to get a buck is just the icing on the cake. Most said that the signs were all there; they know they were out there and the snow the past week did help for tracking. It just was not their time to get one. 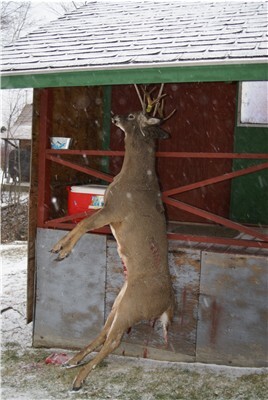 Better luck next year for firearms….although muzzleloader season is still happening so best of luck to you too. and “”Tell the story””. Hunters have a chance to win a coupon and raffle book…..and be entered to win 2 night stay in the region in 2008. I know you all love to tell the stories…just need to put it in writing! Actually, they must NOT be new at all since Kevin got his buck the first day out this week. Mind now that I am just joking around with them. It is good they are seeing more signs of activity this year and they all know that when it is your turn to get the buck, you will. So, since there is no deer to talk about during deer season, I thought I could talk about the wonderful snow we are having today ❗ It started out as light snow and sleet here but the snow flakes kept getting bigger and bigger. Bill said there is about 7 inches of snow in the hills where he was hunting this morning. I think we only have a couple inches here at Cozy Cove but it is still coming down. I do not think that “”true”” hunters really care sometimes. Of course, getting the buck is what they want but I think that they are happy just being out in the woods! A sure sign of deer season in Jackman is the patrolling of hunters through the camps around 7 at night to see if there are any deer hanging on the poles. 😆 There were 3 next door! We will keep you updated of the hunt this month. Good luck to all. BTW, as some like to have snow so they can track their buck, the weather forecast is calling for snow this week….may be more of freezing rain than snow but it is a beginning. The second moose tagged in Jackman on the first day of the moose season. At least the weather has been great. 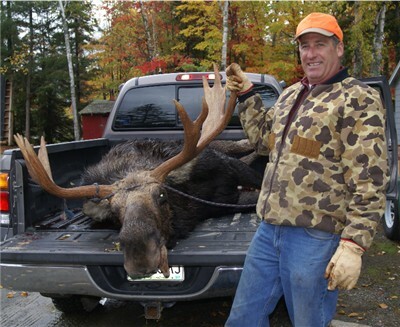 Today is the day when those of you who have been trying for a Maine Moose permit will be decided. Are you going to be the lucky ones ❓ I have to stress the word “”lucky”” in this entry as that is all that it is. We have known people who have applied for 20 years and have never been the “” lucky ones”” and others who apply and get the permit their first time. Somehow that never seems fair. 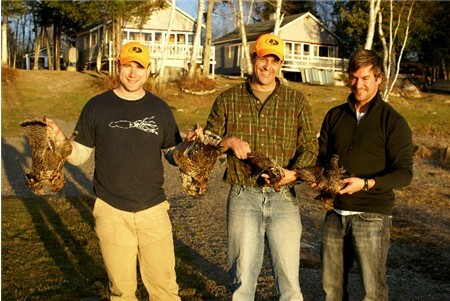 Jackman is in section 8 and the moose hunting dates for this section are October 8-13. If you are one of the “”lucky ones”” bring your Dad, your Son, your uncle and friends and make your reservation soon. We still have cabins available.